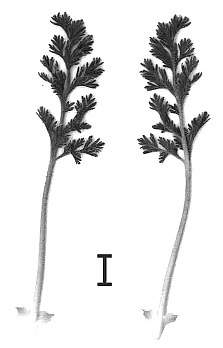 Species Plantarum 3 (1800) 651. Aromatic geophyte 150-300 mm when in flower. The turnip-shaped root forms numerous stem-growing points, branches 10-25 mm, the tuberous system forming clumps of up to 500 mm in diameter in older plants. Greyish green, lamina elliptic in outline, irregularly bi- or tripinnatisect, 30-110 mm long. Pinnae 12-35 mm long, 0.5-1 mm wide, apices rounded, densely villous interspersed with glandular hairs. Petiole 10-130 mm long, rigid, erect to patent. Stipules very conspicuous, obtrullate to ear-shaped, adnate to petioles for 2/3 of their lengths, 15-30 x 8-12 mm. Scape 10-30 mm long, branched, bearing 2-3 pseudo-umbels with (4-)6-15 flowers each, peduncles 40-140 mm long. Pedicel ca. 0.5 mm. 5, lanceolate, apices acute, 9-13 x 1-3 mm, posterior erect, others recurved. Hypanthium 60-100 mm long. 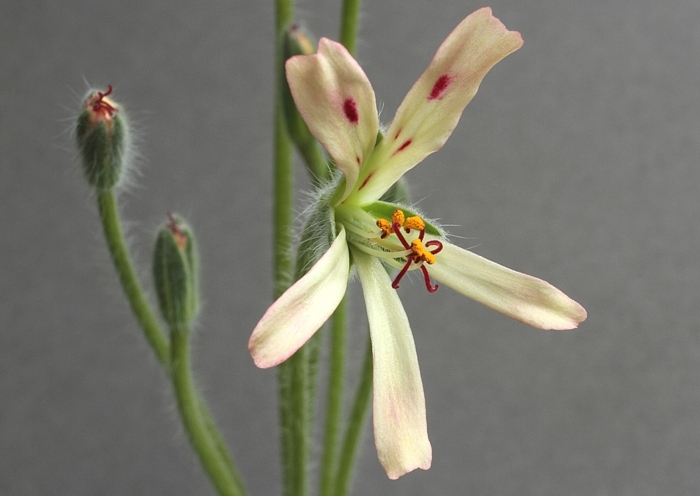 Petals 5, pale yellow, patent during anthesis, posterior two with small pink or dark red blotches in the centre, apices emarginate, 17-23 x 4-7 mm. Anterior three ligulate, bases attenuate, apices emarginate, 15-20 x 2-4 mm. 5 fertile, initially straight, then bending downwards during senescence.. The species was described in Marais's Thesis before it was realised that it should belong to Section Ligularia: it can grow into a much-branched shrub. Since most branching is at ground level and the branches are short it was thought that this is due to frequent grazing by farm animals, which populate the small area of distribution on the west coast where it grows in deep coastal calcareous sands. The plant at the top of the page was grown in dim London greenhouse conditions and shows a sad and uncharacteristically green, almost hairless plant. To be replaced with a photograph of a 'proper' plant but in the meantime a good reminder of how unrecognizable plants grown in unsuitable lighting conditions can be.